You have probably heard of the Space Shuttle. 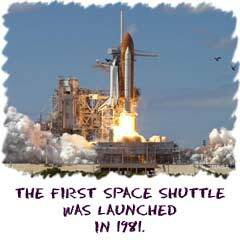 The shuttle Columbia was the first one to make it into orbit on April 12, 1981. They are the first reusable spacecraft on Earth. NASA designed the Shuttle to be a cost-effective way of getting cargo into space and conducting short-term experiments. Over the years, it has carried over 500 humans into orbit. The space shuttle is the most complex machine ever built. It needs to survive a traumatic launch, spend weeks in the vacuum of space, provide facilities to conduct experiments and transport equipment, and return through the atmosphere for a gliding landing on Earth. The shuttle is broken into three sections. The forward fuselage holds the crew cabins (middeck) and flight deck. You will find the payload bay and wings in the mid-fuselage. The aft fuselage is home to the orbital maneuvering systems and three main engines. During a shuttle launch, you will see three main pieces. There are two solid rocket boosters on the sides of the launch vehicle. These boosters are released soon after launch and their fuel has been used up. They fall back to the ocean and are retrieved. The large external tank is the orange fuel container in the center. It's fuel is used to power the three shuttle engines. The external tank is also released after launch (but not reused). The shuttle itself is called the orbiter. It only takes a few minutes to get the shuttle into orbit. Landing is technically much easier than launch. The shuttle adjusts its orbit and glides to the surface. As it passes through the atmosphere, it has to survive very hot temperatures. The temperatures increase because friction is created as the atmosphere moves against the surface of the shuttle. One of the shuttle disasters happened because there were damaged heat shields on the shuttle's wing. When the heat shields are damaged, heat inside the structure can increase and start fires. Even though it has been an exceptional spacecraft, the days of the Space Shuttle will soon be over. There are technical problems that will be improved, but realistically, the initial concepts for the space shuttle were developed in the early 1970s. After 30 years, it is time for a new reusable spacecraft. NASA is also planning more missions to the Moon and Mars. These missions will have a different set of requirements and new features will need to be developed. NASA is currently working on a new project called Orion. Announced in August 2006, Orion will be a crew exploration vehicle that will travel to the Moon and beyond. It is being developed by the NASA Constellation Program.